At the request and with support of the Forestry Sector Support Department (DFSS) of the Ministry of Water and Environment of Uganda, a capacity-building workshop for facilitators of a forest policy process was organized on November 27-30, 2013 through joint efforts between FAO Forestry and FAO representation in Uganda. 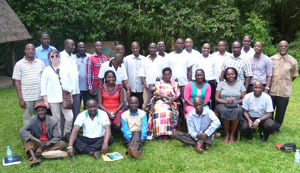 This workshop was building on previous capacity development events organized by the FAO in Uganda, namely stakeholder participation, forest tenure and was focussed on specific skills necessary to facilitate effective forest policy formulation. A day field work was organized for practical application of acquired knowledge. Twelve highly motivated and well prepared participants, representatives of the ministry, forestry and ecological departments, regional forestry units, universities, academia and private sector were invited to participate in the workshop. (iv) how international priorities/engagements could be “balanced” with the daily local priorities. During the workshop, methodological and conceptual presentations were combined with practical exercises and discussions. 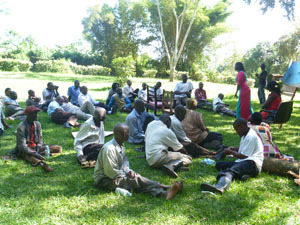 Acquired skills were practiced in the field, at the Mpanga forest reserve, where workshop participants were working with 3 stakeholder groups (i) local villagers, using wood for handicrafts and living; (2) forest reserve administration and (iii) local forest management administration. Facilitated discussion between these 3 groups successfully developed proposals of policy change related to the access to and management of protected areas and to solve 2 very practical conflicting issues.